Hair: Red, straight and reaching to halfway down the back. 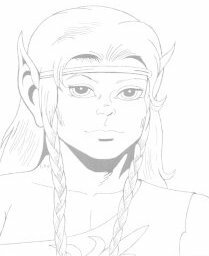 The two locks in front of his ears are braided and he wears a gold circlet around his head, later in life replaced by a leather headband. Being a male Wolfrider of over five hundred years, he has developed face-fur, in the form of a bearded chin. Life history: Redlance is the Wolfriders' resident treeshaper and the best tracker they have. This last ability earned him his previous name of Redmark, but it was changed when he saved Bearclaw's life by impaling an attacking longtooth on a lance. Redlance's early years in the tribe were difficult for him. Although he was an exceptional tracker, he didn't feel very useful, because the treeshaping abilities that he knew were there within him took their time in surfacing. He spent many frustrating years trying to awake them, but it wasn't until the tribe left their forest and reached Sorrow's End that they finally emerged and enabled Redlance to grow the first dreamberry bush in the desert, much to the delight of the other Wolfriders (especially Pike). The experience with feeling useless has given Redlance an excellent understanding of Ember, who often felt useless as a child next to her brother Suntop and her mother Leetah, with their magical powers. Redlance fully understood her feelings and managed to distract and comfort her. Redlance is never far from his devoted lifemate Nightfall. She never left his side during the testing journey through the desert and tended to him while he himself was unconscious and waiting for death. The two of them enjoyed their life in Sorrow's End, but left again together with most of the other Wolfriders to find Cutter. They managed to stay out of the claws of the Chosen Eight's hawks and found Cutter and Skywise, after which they went to Blue Mountain to rescue the other Wolfriders. Redlance initially stayed outside to guard the twins, but was later brought in together with Ember and Suntop so the twins could placate Lord Voll. Later, during the war with the Frozen Mountain trolls, Redlance stayed behind again, this time guarding not only the twins but the Go-Back children as well, and was given the unexpected treasure of Nightfall's soul name so she would always stay with him in case she died. He himself came close to dying as well though: King Guttlekraw decided that an attack at the Go-Back lodge would hurt the elves the most, as all elves value children above everything, and Redlance was faced with a vicious attack by twelve trolls. Together with the wolves and some help of the children he was able to defeat them, but the fight had been terrible and the horrors Redlance had seen were too much for his gentle nature, so he retreated within himself to escape them. Nightfall found him like that and got him back again by asking his soul name so their souls could join and she could cleanse him of what he had seen. After the war the Wolfriders returned to the Forbidden Grove, where Redlance shaped a new holt for them. This same holt was threatened three years later, when humans attacked and, after they were initially driven back, tried to set it on fire. Redlance was determined not to let this holt burn down, like the Father Tree Holt had done, and used his treeshaping powers to let the trees give off so much moisture that the flames died, even though this meant standing in full view of the humans. Luckily Dart and his Jack-wolfriders arrived just in time to help the Wolfriders out. The exchange of soul names between Redlance and Nightfall had made their relationship even closer than it was already, and all that was missing was a cub. To remedy this, the pair of them called in the help of Leetah, who 'forced' Recognition on them, resulting in the birth of Tyleet. Tyleet was born in Thorny Mountain Holt, across the Vastdeep Water, where Redlance had shaped another new holt to await the return of the Palace, which Rayek had flown into the future. According to Cutter's new rules, Redlance shaped this holt high up in the trees so the humans would never notice the elves were even there, and surpassed himself in doing it, most likely because of the lingering effect of the Palace on him. Redlance and Nightfall also offered to share their den with Cutter so he wouldn't be alone and so he could get hope from the life growing in Nightfall. During the war for the Palace Shards, after the return of the Palace, both Redlance and Nightfall went with Ember to find a new holt where the tribe could be safe. There wasn't much treeshaping to do in Howling Rock Holt however, as there were no large trees there. Redlance and Nightfall returned with Cutter and his part of the tribe to the site of the original Father Tree Holt after the Shards war, there to establish yet another new holt.